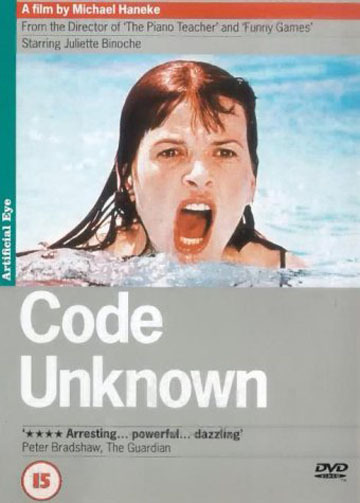 Code Unknown takes a brief incident on a Parisian street and follows the paths of all its main characters over the subsequent weeks, tracing the subtle ways in which different lives intertwine in modern-day Europe. On a busy Paris boulevard, a youth scornfully tosses a crumpled paper bag into the outstretched hands of a beggar woman. This is the bond which, for an instant, links several very different characters: Anne (Binoche), an actress; her war photographer boyfriend Georges; his farmer father and younger brother Jean, who, contrary to his father's wishes, has no interest in inheriting the farm; Amandou, a music teacher for deaf-mute children, and his family, who originate from Africa; and Maria a Romanian immigrant.